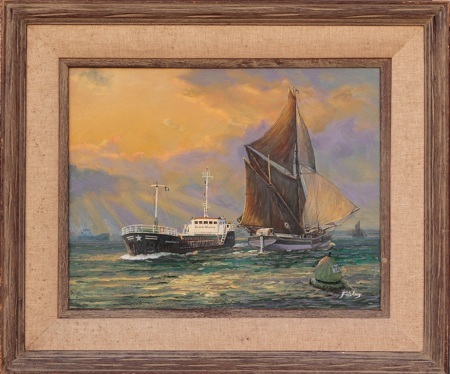 By Gordon Frickers 35 x 46 cm (14″ x 18″), A marine painting in oils, original available, £ 1,200.00, also available as a signed print from £147.00 including postage. S.B. Cambria built in 1906 became the last working Thames Sailing barge. Cambria now owned by the Cambria Trust re-floated 21.03.11 following a major refit. Cambria , part of our heritage will become an educational resource. Cambria Trust. M.V. “ River Trader ” built 1989, British registered, and one of the newest of the Armac Marine fleet continues to carry the ‘Red Duster’ continuing similar trading well into the 21st century. “New and Old” by Gordon Frickers measures a modest 35 x 46 cm (14″ x 18″), so you may be seeing this ‘larger than life’ on your computer! 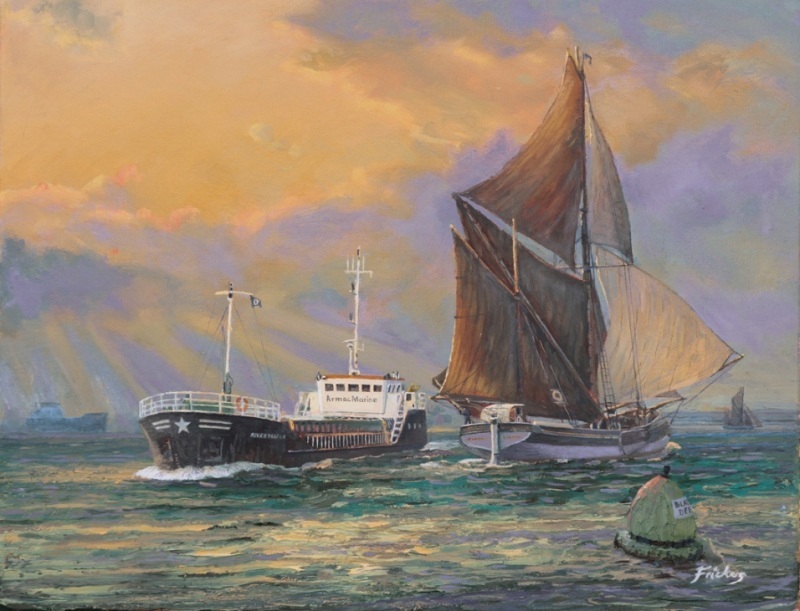 What we can be sure of is many famous keels have floated over those waters including as painted by WMJ Turner, the fighting Temerarie towed to her last berth and including many Thames barges over 2000 of which were operated on the Thames at the beginning of the 20th century. This painting is included in a unique occasion, “Life on the Ocean Wave” the Frickers marine paintings Exhibition at and by invitation in the European Parliament, Brussels May 2011. Our particular thanks to Barry Pickthall (Pickthall Picture Library) and author, journalist and sailor Sam Llewellyn for the inspiration and to Basil Brambleby secretary of the Cambria Trust and Tim Lowery of Armac Marine. Also my friends at the UK Hydrographic Office at Taunton and Trinity House London who made sure my ships are in Black Deep were not sitting on a sand bank. All helped enormously and willingly, giving authority to this painting “New and Old”. See also COASTAL SHIPPING DOCUMENTARY: A Passage To Wisbech.